Spontaneous Retroperitoneal Haematoma Caused By Lumbar Artery Bleed. INTRODUCTION: Spontaneous retroperitoneal hemorrhage can present as a rare life-threatening event. 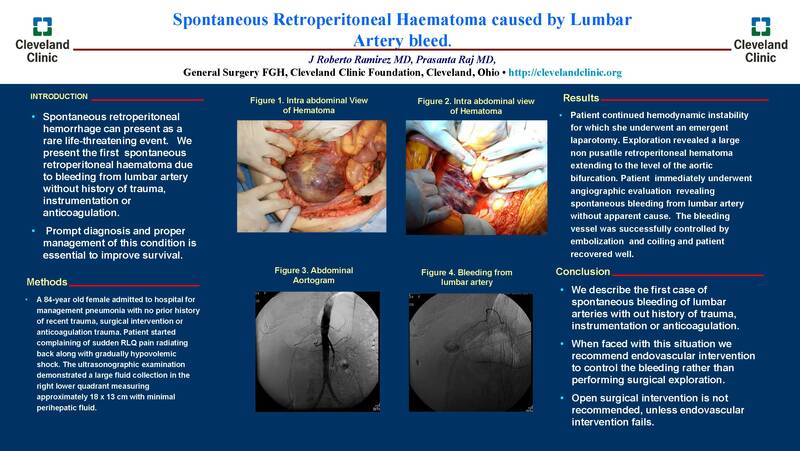 We present the first spontaneous retroperitoneal haematoma due to bleeding from lumbar artery without history of trauma, instrumentation or anticoagulation. Prompt diagnosis and proper management of this condition is essential to improve survival. METHODS AND PROCEDURES: A 84-year old female admitted to hospital for management pneumonia with no prior history of recent trauma, surgical intervention or anticoagulation trauma. Patient started complaining of sudden RLQ pain radiating back along with gradually hypovolemic shock. The ultrasonographic examination demonstrated a large fluid collection in the right lower quadrant measuring approximately 18 x 13 cm with minimal perihepatic fluid. Patient continued hemodynamic instability for which she underwent an emergent laparotomy. Exploration revealed a large retroperitoneal haematoma extending to the level of the aortic bifurcation, without evidence of expanding or active intraperitoneal. Patient was subsequently sent immediately to endovascular suite, revealing spontaneous bleeding from lumbar artery with out apparent cause. The bleeding vessel was successfully stopped by embolization of bleeding vessel and patient recovered well. RESULTS: We describe the first case of spontaneous bleeding of lumbar arteries with out history of trauma, instrumentation or anticoagulation. When faced with situation we recommend endovascular intervention to control the bleeding rather than performing surgical exploration.